Mayfield Floral, your local Cleveland florist, offers professionally designed flower arrangements and gift baskets for all occasions paired with outstanding customer service. We can help you in flower delivery to Cleveland and surrounding areas, and we can even handle flower delivery nationwide through our network of trusted florists. Need to send a last minute gift? It’s no problem with Mayfield Floral as we offer same day flower delivery at no additional cost. Few gifts create an impression like fresh, colorful flowers. Make your next occasion one to remember with a gift from Mayfield Floral. From lavish anniversary flowers to heartfelt sympathy flower arrangements, Mayfield Floral is the florist in Cleveland to call when you want something special. Allow us to be your flower source for Mother's Day flowers, Valentine's Day flowers, or any other holiday. For the most elegant flowers in Cleveland OH including Christmas flowers and birthday flowers, call Mayfield Floral. Ordering a beautiful bouquet of fresh, hand-arranged flowers in Cleveland has never been easier. Mayfield Floral has a large selection to choose from in every style for any occasion. Browse our wide selection of floral arrangements online or let our florists in Cleveland create a custom design just for you. Mayfield Floral is your florist for reliable flower delivery in Cleveland or any city you choose. Beautiful, fresh flowers are just a few clicks away! When you order online, you sometimes don’t know what you’re going to get. Some floral sites ship flowers from massive warehouses, so your recipients receive a cardboard box with uncut flowers on their doorstep. Not so with Mayfield Floral. 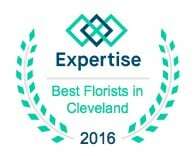 We’re an actual florist in Cleveland, staffed by people whose goal is to satisfy our customers. When you order through our secure website, you’re sure to get artistically hand-arranged, hand-delivered fresh flowers in Cleveland and nationwide. Why risk sending something your loved ones have to unpack and arrange themselves when you can send an abundant arrangement from Mayfield Floral?